Candidates can register for Manithaneyam Free Group 1 Mains Coahing at http://saidaiduraisamysmanidhaneyam.com website. 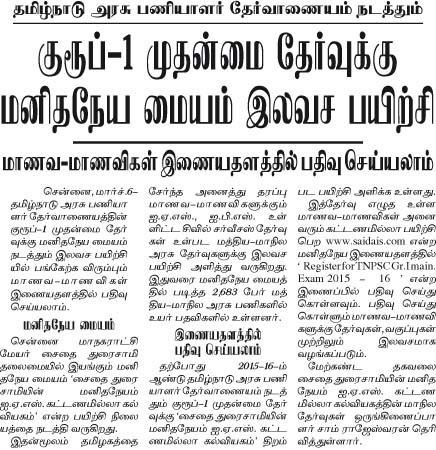 (Click on the link Register for TNPSC Gr1 Main Exam 2015-2016). 14-07-2015 : Manithaneyam IAS Academy women candidates scored top two positions in the Civil Services Exam 2014-2015 Final Interview Marks. 30-07-2014 : Manidhaneyam Free IAS Coaching 2014-2015 Entrance Exam Hall Ticket has been issued in the official website http://saidaiduraisamysmanidhaneyam.com . Download soon. Manithaneyam IAS Academy is providing free coaching for Civil Service Examinations and TNPSC Exams also. The institute was founded by Saidai Duraisami , the present Mayor of Chennai. According to newspaper reports, this year 46 candidates have successfully cleared the IAS Exam 2014 from this institute. The free coaching will be provided from this year August 2014 to May 2015 . If you want to join in Manithaneyam IAS Coaching Academy , you should write an entrance exam . You can download the Syllbus for Manithaneyam IAS Academy Entrance Exam from their website www.saidais.com . Based on the entrance exam result about 2000 candidates will be provioded free coaching this year . Chennai, Vellore, Salem, Trichy, Erode, Coimbatore, Karur, Didigul, Kanyakumari, Sivagangai, Ramanathapuram etc. The candidates are asked to apply online through www.saidais.com . When Hall Ticket will be Issued for the Entrance Exam ? The aspirants can download the Hall Tickets from www.saidais.com from 23.07.2014. The downloaded / print out of the Hall Ticket should be attested by a Government Officer . The Exam is scheduled to be conducted on 03-08-2014 .